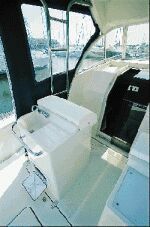 The F300 Bluetime is an extremely versatile boat with practical deck space, rational and comfortable living quarters and an excellent quality price ratio. Zeta Group is the building yard and it does its best to meet the requirements of an extremely varied and specialized clientele. As a matter of fact, the boat was built with extremely elongated bow and poop in order to offer wide and comfortable aft and bow platforms. 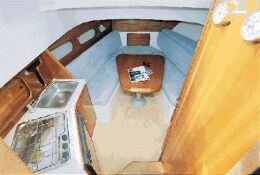 With an overall length of 30'6", she offers a very comfortable layout: minimum headroom is 5'10", a bathroom worth its name, 2,3 or even 4 berths and a dinette with a table that comfortably sits four persons. Under way, the boat performs very well. She is fitted with an propeller shaft with an inclination of less than 12°, a hull with a 22° deadrise throughout. She is very maneuverable and is as stable as bigger boats. During sea trials, she was fitted with 2x185 hp TD Yanmar and her minimum planing speed was of approximately 11 knots, taking 6 seconds to reach planing speed with no flaps and 4 seconds with flaps. 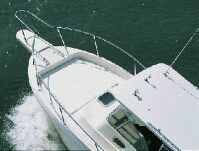 Maximum speed was recorded to be approximately 32 knots and cruising speed approximately 27 knots. This speed was recorded with six passengers on board, with the fly bridge top fitted and 105 gallons of loaded fuel/water. 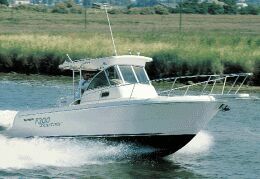 Again, the F300 Bluetime is an extremely versatile boat and this is her best quality. She is capable of satisfying the needs of most boaters, even of those who owned bigger boats but decide to buy the smaller F300 because of her elegant and simple lines, comfortable and practical accommodation. Draft from lower tip of propellers: 2'11"
Light displacement with two engines and no hard top: 7,506 lbs. Total engine and reduction gears weight: 1545 lbs. Standard fittings: bow platform, pulpit with lifeline, 4 mooring bitts, 2 cockpit hawses, 1 hatch, 2 portholes. Helm station in cockpit: pilot seat with double adjustment, hydraulic wheel steering, Ultraflex throttle remote controls, full instruments and engine indicators, compass, electric panel and electronic instrument dashboard. 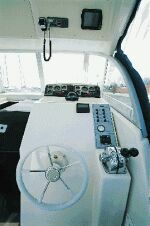 Cockpit arrangement and fittings: bow platform, sunning area, bow pulpit, optional hard top, on request cockpit may be fitted with multi-function cabinets with sink and two settees, aft platform with recessed swimming ladder and bait well and refrigerated fishbox. Deck fittings are in AISI 316 L stainless steel; windows are in tempered glass.